No matter whether you're getting hitched (congrats!) or just attending (have fun! 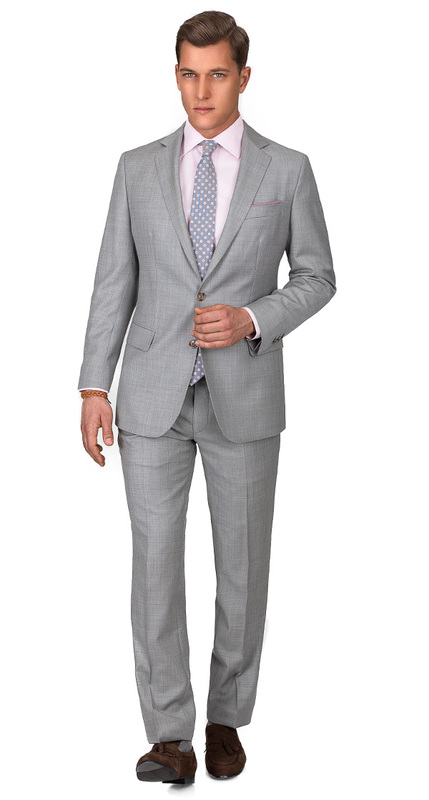 ), here's a list of our top 9 wedding suits & wedding style recommendations for summer weddings. Wedding suits should always be versatile – too many groomsmen are already stuck with an exotic suit design from the 60s and with a fabric sheen so strong that you need sunglasses just to look at the suit. Here’s a sartorially savvy approach to men's wedding attire. You'll vow to never wear a fully-lined jacket in hot weather again, once you see the benefits of jackets with half-lining or quarter lining. Half-lined jackets have no lining on the back for better ventilation, while quarter lined jackets have lining just in the sleeves and shoulders for an even lighter feel. When you customize your suit visit the additional options menu to select this option - if it is not listed for the custom suit you are ordering, please request it with a note. Hats are classy, sunburns are not. Use sunscreen, but a nice fedora will also keep you cool & protect your eyes from the sun. If in doubt, google "hats at Pitti Uomo" for extra style inspiration. And pat yourself on the back for the smart investment. When the temperature gets high lose the jacket and put on the vest for a tailored look in your cool sleeveless suit. 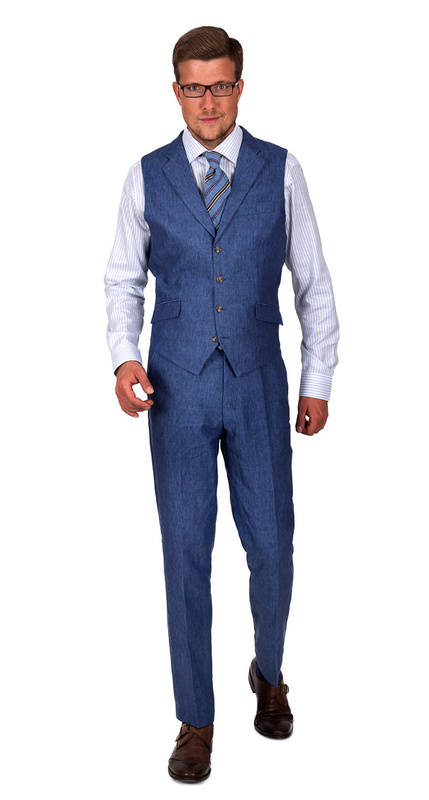 And since the vest & pants look is at the center of this style, make sure you get a lapel vest. Light grey absorbs less light than medium greys or charcoal and is an all-around good choice for spring & summer. You'll get a lot of extra points for a seasonal wool-mohair fabric, but a light grey pure wool is also perfectly fine, if the fabric is light and breathable. 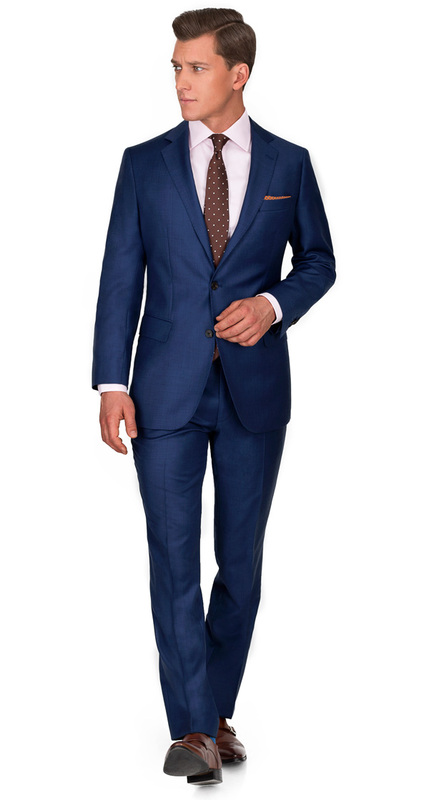 Don't feel out of place with a dark navy suit. Add some color to your summer wedding look and enjoy the confidence that comes with it. 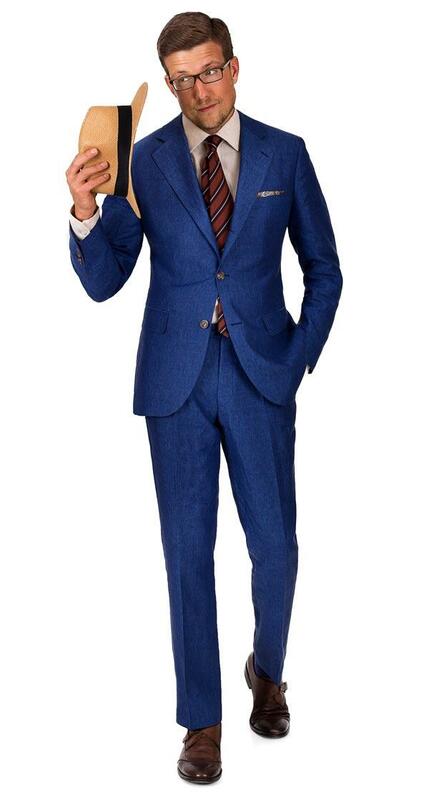 Stronger, saturated shades of blue, such as the one in the W. Suit in Intense Blue Wool are very much on trend, and lighter shades of blue such as sky blue are always a safe choice for spring & summer. 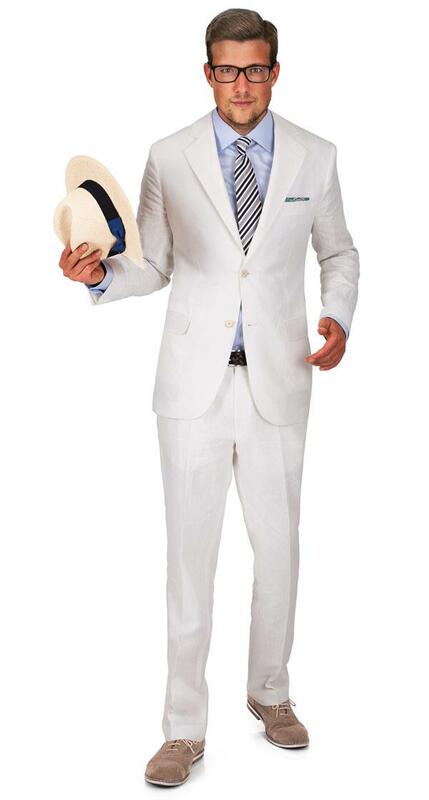 An off-white linen suit is the ultimate choice for beach weddings. Style with a light blue shirt & accessories and remember that it's an off-white fabric, so black or very dark pieces of your attire may show through. Admittedly, this look will make it onto any list of top wedding styles for any climate between the Arctic circle and the Mojave Desert. It's timeless, and therein lays its appeal - get your custom tuxedo, go easy on the carbohydrates and you've made an investment for life (well, it depends on how hard you party). Here’s a modern take on seersucker, sans the crinkling. Traditional seersucker has a strong southern charm, but always looks as if you accidentally tumble-dried it twenty times in a row. 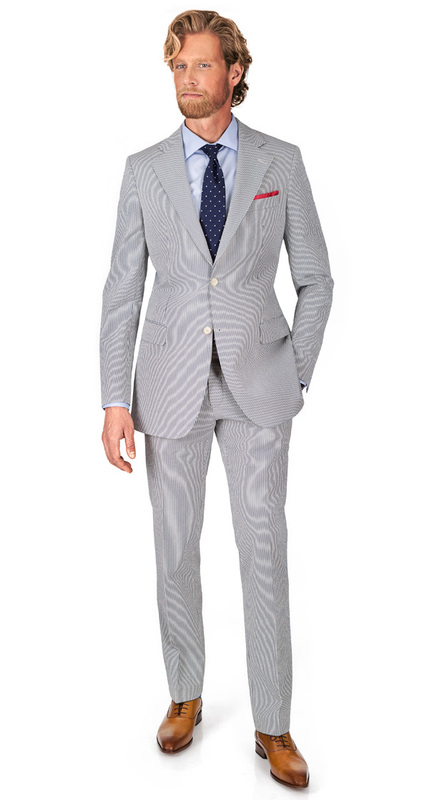 Don't be intimidated by the striped design - this suit is surprisingly versatile. The secret? Throw on the jacket with your favorite pair of chinos and you have a superb preppy summer look. Mix the pants with any polo shirt for the weekends for a trifecta of timeless seersucker looks. 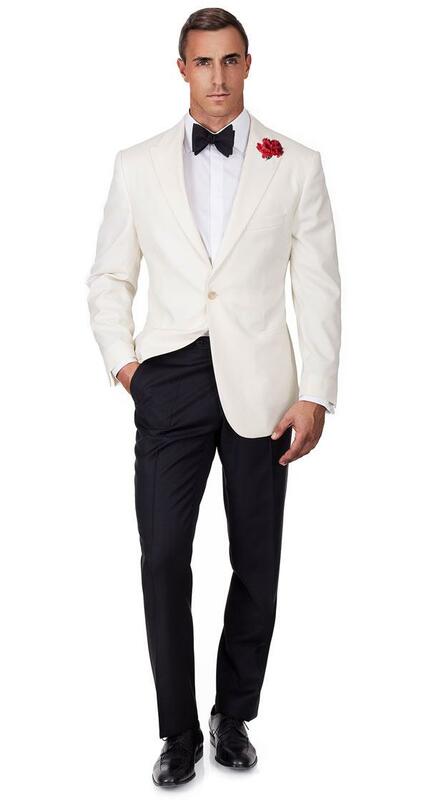 For the sartorially inclined, the ivory dinner suit is the holy grail of formal attire for summer events. 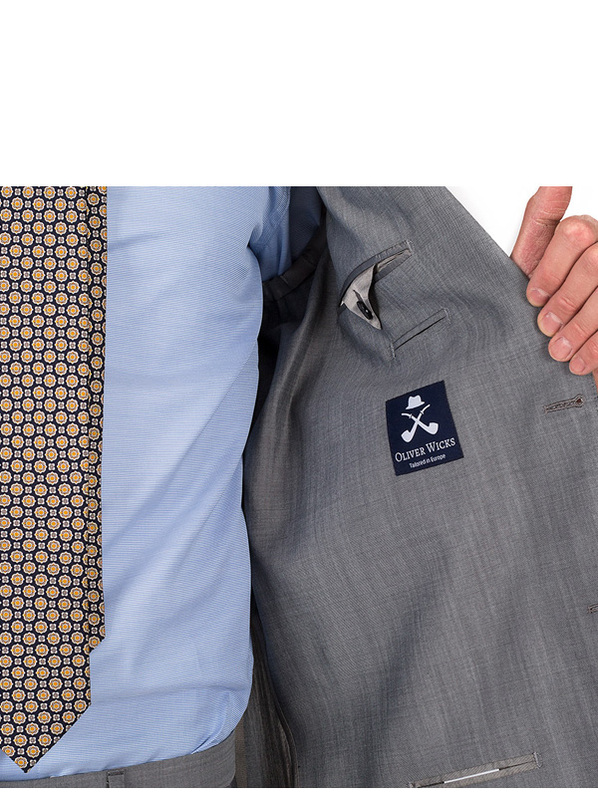 Our favorite design features self-faced lapels and mother-of-pearl buttons. 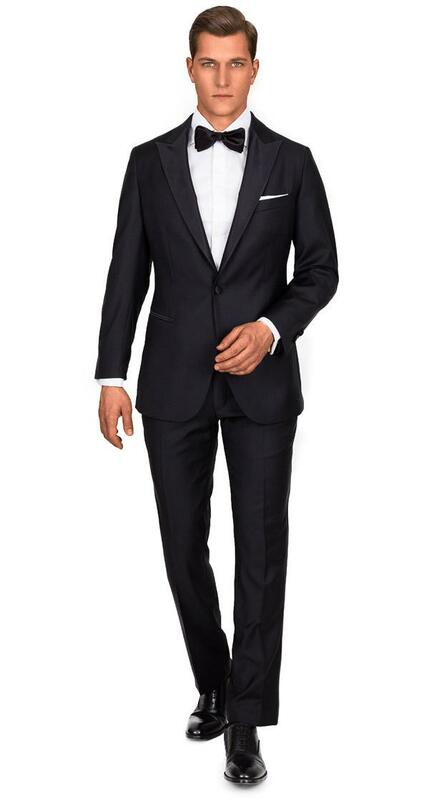 Adhere to the traditions and always wear the jacket with black tuxedo pants.